Daily Walking, Working, and Winning by God's Word by Rev. Dr. Alvin C. Hathaway Sr. The journey of life is uncertain and filled with unexpected twists and turns. This blog: "Daily Walking, Working and Winning by God's Word," is intended to provide our readers with the encouraging word of God as a practical guide in your daily journey. Use the universal truths of God's word "to be a light unto your path, and a lamp unto your feet." Peace! Do you still get exciting about watching a fireworks scene on New Year's Eve? I have fond memories of seeing fireworks in many different cities: Time's Square, Atlanta, Ga., Washington, D.C., and of course Baltimore, MD. Over the years I have made me way to a religious service in thanks and praise for God allowing me to see another year in this journey of life. It's somewhat unfortunate that urban communities have become somewhat challenged. What may seem to be the sounds of fireworks, in some instances, is the sound of gun shots. Due to the nature of our congregation at Union Baptist Church, we have changed the traditional "Watch Night" service from 11:00 p.m. to 12:00 a.m. to 7:00 p.m. to 8:00 p.m. Streets become dangerous at night and many persons where staying home to avoid potential danger. Nevertheless, even with changes in culture and society, the spirit of the Living God does not changes. We are able to still give God praise, worship and honor even with the shift in hours. Why, because we serve a God who is not bound by our timetable. 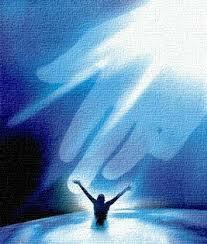 He operates above time and when he so chooses steps into time and becomes an on time God. For that I am thankful. Happy New Year and enjoy the power, the presence and the peace of God as we enter the second decade of a new millennium. Peace! My family gave me a piano keyboard for Christmas. It was something I always wanted, but had refused to buy. I couldn't thank them enough. I pulled out my old piano training books. Reviewed my flash cards and sat down to bang on the keys, it was humbling to say the least. So much to learn: teaching yourself to read music, learning the keys again, discerning the notes, symbols, and keys. Wow! Learning to play the piano will take a lifetime. I'm sorry I took so much time off. Nevertheless, this is my New Year's resolution - to play the songs that warm the heart and provide strength to the spirit. My hat is off to all those who continue to make music everyday. Who sing or play with the vest of their youth. Who endeavor to continue to learn and perfect the gift that only comes from God. Who practice, practice, and practice to master a song and to become proficient in their craft. Everyone should play some music. Everyone should allow music to become integral to their spirit. I love music! Sweet, Sweet, Music!!!! Mr. Percy Sutton was an icon. He understood what those of us in Baltimore missed - He acquired and restored the Apollo Theater. We permitted our Royal Theater to be demolished. So unfortunate that we didn't have a political/business figure like Mr. Sutton. Mr. Sutton combined the negotiating skills of a politician with the business acumen of an entrepreneur. So successful as a negotiator he manage to go and complete law school without finishing his undergraduate degree. An accomplished lawyer he served as head of his borough. He was the ultimate go to guy in New York. He was proud of his African American heritage and interacted with the famous and infamous. Personally, I admired his understanding of controlling media outlets. He providing a training ground for many businesses person, think Ms. Dorothy Brunson. He provided inspiration for others, think Ms. Cathy Hughes. One New Year's eve many years ago, I attended with a friend the final show at the Apollo Theater before he renovated it. The show was electric and the place was magical. Now the world knows, "Showtime at the Apollo." Many artists have used that theater as their platform to success. Thanks you Mr. Percy Sutton for understanding that if we want to preserve our treasures it is our responsibility to acquire them, fund them and sustain them. Peace! Mistakes, mistakes, mistakes! In a game, as well as in life, are difficult to overcome. Unfortunately, you cannot retract loose words or retrace lowly steps. Too many people live life like our Ravens did today. One quarter you are on top and then next quarter you are error prone. After the game is over you only have yourself to blame. The reality for each of us is that our mistakes are not played on national television for all to see. My hat is off to Luke Durant, Jr. who found his niche as the African American Santa Claus in Mondawmin Mall. Quite the entrepreneur, Brother Durant was involved in a number of business ventures. His lasting success was in owning a candy store in the mall. It's my understanding his store will close at the end of 2009. I'm happy to hear that Brother Durant will continue to serve as "our" Santa Claus for years to come. His image as a Santa who looks like "us" reinforces to our children that we can be affirmative in our culture and self-worth is a value. Also, we can look at our own images with esteem. Luke Durant's commitment to being a positive African American image is worthy of honor and applause. Thank you Luke for helping our children to enjoy a Merry Christmas throughout the years. In the Biblical scriptures a central question was asked during the birth of Jesus Christ, "have you seen the star?". This question strikes at the center of the Christian belief system. Because it in essence means are you able to see spiritually versus physically. As we move into 2010, I pray that each of our spiritual ability to see is increased and sharpened. Why? God is always shining a distinctive star for you and me that signals his deliverance from our condition and/or situation. This will be the game of the season - The Ravens versus The Steelers. I sure hate to rush the week. I definitely will not rush the worship service. But, this will be a game to watch. It appears that the Steelers have their mojo back. The Ravens appear to want to reach another level. Therefore, let the best team win. Who do you pick? Black and yellow or Black and purple! The distinguishing color is either yellow or purple. Hmmm! I think I will take purple. Now the real work comes, persons have to get out of their homes to go to their jobs. No excuses! Many stayed home from church yesterday expressing claims of ice and snow. But, "the man" doesn't want to hear any excuses when you want to get paid. Therefore, get out with a smile and be careful because the streets are still icy. Enjoy the day and make the best of all possible opportunities. I think I may skip work today; drink some hot chocolate, and, watch movies. I won't tell on you, if you don't tell on me! Do you enjoy being snowbound in your house? What are you doing to past the time away? Are you in conversation with others who live with you or are each of you doing your own thing? Some are sleeping. Some are watching television. Some are texting their friends. Some are writing on blogging. Whatever you are doing? Is it fun and is it the best way to spend your time. I ventured out into the snowstorm today to serve a family in need. Driving back I got stuck attempting to drive up a hill. Two members of the Baltimore City Department of Public Works drove by, turned around, and got out of their truck to assist. One was a male and the other was a female. They stayed with me to assist me until I was able to turn around and drive away. That's public service. They are two individuals I would love to get to know. I gave them my card and told them they have a standing invitation to visit with me and talk to me. If they is anything I can do for either of them. They can consider it done! When we as a community learn the benefit of assisting strangers, we will never be able to hold the blessings God has in store for us. The word is true, "you may be entertaining angels unaware." 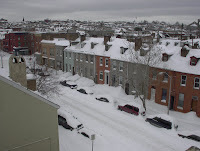 Do you believe that the weather person is correct and that in Baltimore it will snow all day tomorrow? If so are you prepared for the snow? Why does it seem to snow on the weekends and not during the work week? I pray you are ready and that you have made alternate plans. The Ravens have changed the starting time for the game on Sunday from 1:00 p.m. to 4:15 p.m. I wonder why? Is it possible that the snow will continue through Sunday afternoon? If so, I wonder how many people will venture out into the weather to make their way to their house of worship? I have a funeral service on Saturday and worship service on Sunday. By God's strength I plan to be at both. Be safe in your travels! How would you feel if you woke in the morning to leave home and water this high is gushing down the front street of your home? Persons on Argonne Drive had that experience today. Officials say a water main broke. Given the deferred maintenance of our public works system it is surprising that we do not have more of these incidents. No aging city is immune to cracking pipes and utilities. Katrina type occurrences can happen anywhere in America at anytime. This afternoon in West Baltimore at Union Baptist Church from 12:00 noon to 1:00 p.m. individuals and institutional leaders from the West Baltimore Community of Upton will gather together under the theme, "Reclaiming our Community by Reaching for the Heights of the Promise." This service signals a change in the relationship structure of the community. A necessary change if this community is to be a serious contender for a "Promise Neighborhood" grant that the Obama Administration intends to provide 20 communities across America who seek to create Harlem Children Zone type models within their community. What is significant about today's service is that from a grassroots level the leaders have decided to change the way they have been doing business and break down the silos that have previously existed. You may listen to Dr. Hathaway and others who where interviewed by Ms. Donna Owens of WYPR Radio 88.1 discussing the Harlem Children's Zone concept and its potential within Upton. Over 30 institutions and organizations will be represented at this historic gathering of leaders and community that will signal a swift in how business will forever be done in West Baltimore's Upton Community. All are committed to changing the climate and cultural of the community for the better. All are committed to improving the quality of life for each of its residents. All are committed to improving the outcomes for all of its children. If you are in the neighborhood come by Union Baptist Church, 1219 Druid Hill Avenue, from 12:00 noon to 1:00 p.m. The movement begins for "Community Rights because Place Matters". Where a person lives is important to the fabric of our society. If we are going to change the conditions of the communities of America, we have to be the change. From the movie Notorious, it was proclaimed that "if we are going to change the world, we will first have to change ourselves." Wednesday, December 16, 2009 will be a memorable day in the life of the Hathaway Family. After a long academic journey, Alvin Jr. will be sworn into the Maryland Bar as an attorney licensed to practice in the State of Maryland. The Honorable Robert M. Bell, Chief Judge of the Court of Special Appeals will administer the oath. Judge Robert Bell was the person who encouraged Alvin Jr. to enroll in a double Master of Business Administration and Juris Doctor program at West Virginia University School of Law and the School of Business. His grandfather, Mr. Charles A. Hathaway will be one of the persons who will be beaming with pride - he will witness his grandson stepping into Maryland history. While I will exhibit the pride of a father. My wife, his mother, will be overjoyed. His sister will be excited. This family honor makes me more determined to fight all forces that would limit opportunities for children within our community to reach their full potential. I am particularly concerned about urban elementary and middle schools that are failing our youth at every turn. Within the Upton Community of West Baltimore change is going to come - So Help Me God! Regardless of what you may think about his theology, Dr. Oral Roberts built institutions that will live on and carry out his vision of God's Kingdom. We in ministry have the same challenge to create institutions to carry out the vision God has given to us. The Senior Choir of Union Baptist Church will present Camille Saint-Saems' "Christmas Oratorio" on Sunday, December 20, 2009 at 11:00 a.m. in the Main Sanctuary, 1219 Druid Hill Avenue. Featuring: Alma Garrick Macer, Soprano; Kay Davis, Soprano; Crystal Freeman, Mezzo-Soprano; Joy September Dobson, Contralto; Keith Pennick, Tenor; and Derrick Thompson, Baritone. Special performance by Brittany Wharry, Classical Guitarist. This service will ushering everyone into the Christmas Holiday spirit. Recent news events involving international sports figures, professional football players, local and national political figures causes one to pause and ask the Marvin Gayish question, "What's going on?" Why are we witnessing a period of never ending moral bankruptcy? Why are there so many instances of decadence and deprivation? Are humans destined to failings and flaws? If the Biblical record is true? Yes! The human species left to his own devices is destined to sin. Without the power of God by ourselves we are incapable of resisting the evil plans of Satan to kill, steal and destroy. Therefore, every human being needs one of more "prayer partners." Persons who hold you accountable to a high moral standard. Persons who are within your inner circle who know you, understand your weaknesses, and stand with you to continually point you to God as your strength. A prayer partner who you are unable to duck. A prayer partner that will accept no excuses. A prayer partner who demands the inner conviction of a God fearing life. "No person is an island." We cannot move through the journey of life isolated from persons who demand of us high standards for living. I would pray that everyone identifies a person(s) who will covenant with them to be their prayer partner. 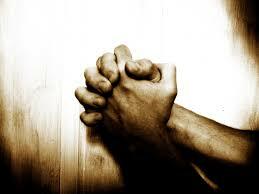 Instead of a gossip queen or a beer drinking buddy; obtain a prayer partner. A person who understands the power of prayer and the ever present need to call on your Heavenly Father for strength and guidance. I have avoided making any reference of the Baltimore Ravens in my daily messages. Professional football is a rough and tough sport. Every situation is potentially a dangerous situation. So many injuries and accidents the league is becoming increasingly focused upon protecting the athletes. Nevertheless, last night's Monday Night Football game begs some attention. As I watched the game I realized that in sports and in life you have to have discipline. Without discipline you are subject to fouls and penalties. In sports as well as in life you need a leader to take charge when you are in difficult situations. Finally in sports and in life your offense and defense must preform at an excellent level. The game of football, as well as, the game of life will be lost when you lack discipline, when you are leaderless, and when you performance is less than excellent. Should the Ravens have taken advantage of the opportunities given to them? Should the referees have been a little more lenient with their calls? All I can say is that in sports and in life you will earn what you get and you will get what you earn. Live life with discipline, understand that God is your leader, and pray that your offense and your defense is sufficient. Should you have a "real" tree in your home or an artificial tree? Over the years I have gone back and forth in this discussion. The smell of pine is wonderful. The fallen needles all over the floor is awful. The symmetry of a natural tree reminds you of winter's wonder. The looming danger of a fire is fearful. Where do you land? Do you bring a "real" tree into your home each year to decorate with all of your Christmas lights and ornaments? Or, do you bring out the trusty dusty that looks the same, is put together in the same way and decorate it in the same manner. Why don't you take a page from the White House and use a different decorating scheme each year. I tried that but only got as far as changing the color of my light bulbs. Well if Christmas is only about the tree, I'm far from the point. For me Christmas is about seeing the youth perform in our annual Christmas eve celebration. It's about feeding families with Christmas baskets. It's about seeing the joy in children's eyes who are not related to you, but you have partially filled their Christmas list wish. It's about being reminded of the love of God who comes to us in the form of a child. For me Christmas is more about the potential for good and the memories of all that is good. It is greater than a tree either "real" or artificial. How quickly time moves? The Christmas season is approaching. Right in the midst of a terrible recession the season demands a change in our moods. From sadness to joy, from sorrow to jubilation, from gloom to ecstasy, we feel the need within our spirits to be jolly. It always amazes me when I see the wide array of Christmas lighting to goes on within a community. From the majestic display of the Washington Monument, to the community street lighting of 34th Street in Remington, and to the individual displays on houses throughout the city; we feel the need to light up the exterior spaces, even if the interior space begs to differ. Nevertheless, we are to praise God in all things and at all times. What time is it? This is the time to remember the joy of a new born baby entering into the world as our Savior. What time is it? This is the time to enjoy the blessings you have and are receiving. What time is it? This is the time to thank God from whom all blessing flow. The Christmas season is a wonderful time to be alive and full of hope. 50 of South Africa's finest tennis players will worship at Union Baptist Church on Sunday, December 6, 2009 at 11:00 a.m. These young tennis players are 13 years and younger. We are excited to welcome them. They are led by Mr. Louis Bolling, a member of our church. International travel is a worthwhile educational experience. As these young people interact with our youth, relationships will develop that are lasting and that will expand the horizons of friendship across the Atlantic Ocean. An invitation is extended to my Face Book Family to join in this experience. Bring your young people to interact with our South African relatives. 1219 Druid Hill Avenue, Baltimore, MD 21217 (410) 523-6880. One must recognize that our system of justice is all we have to determine what behavior is or is not according to the law. Our society would disintegrate if there was not such a system of justice. It is comforting to know that the pendulum of justice swings both ways. It is a time honored creed that justice is blind. For those of us within the African American community who have suffered at the hands of justice that on its surface seemed tilted against us, we can only hang our heads in shame that a sister who rose from the very depths of our community, who understood the pain and pathos of our community; now find herself going to bed tonight with a conviction of a misdemeanor crime. How unfortunate we are because to create a Mayor of a City such as Baltimore takes at a minimum 15 years of service. It requires a graduate education and a life long commitment to service. One must expose themselves to the public scrutiny that few survive to commit to a process of distributing limited public resources on behalf of people. Along the way you seek to assist those your know and those you care for. Mayor Shelia Dixon's story is a tragic one. It is a story that is repeated throughout Baltimore - promise shot down too soon. Mahatma Gandhi said it long ago, "public service mandates public accountability." As we discuss and critique our Mayor, may we all know that "he who is without sin, let them cast the first stone." My prayers are for her and her family as they reestablish there lives within Baltimore City. How many people are still eating turkey? I like turkey salad. I like turkey with gravy. I like turkey sandwiches. I like turkey. President Obama gave the traditional pardon to a turkey, but all of his cousins and relatives didn't get any breaks. I wonder how much turkey is consumed on Thanksgiving? Well, I pray every one's holiday was enjoyable and that you experienced the peace and presence of family and friends. One of the issues brewing as the Maryland State Legislature prepares to return to session after the holidays is a bill that would permit wineries to ship wine directly to consumers. Maryland is one of a few states that doesn't permit direct shipping. As a result Marylanders have to go to a retailer who has bought the wine from a wholesaler to pick up their favorite blend of grapes. While I have given up drinking long ago, I do support the right of each individual who chooses to buy directly from the vine yard. The appropriate taxes could still be assessed. While some of the markup would be reduced because "grapes" would not have to move through extra sets of hands. The Maryland Legislature should free the grapes to be consumed directly by persons who seek to buy directly from the winery. Happy Thanksgiving. Enjoy your time with family and friends. As you pray remember that there are those who struggle with holiday depression and with the financial recession. While the poor will always be with us we are still commanded to look at for the last, the least, and the lost. Therefore, always know that random acts of kindness are always in order. Especially during the holiday season. Be blessed and continue to be a blessing. Peace! How many persons remember 1984 when we where excited about Rev. Jesse Jackson's run for the Presidency? I was in this room in Washington. D.C. when the announcement was made. After a closed door meeting in Atlanta the day before where African American leaders were meeting to decision who would run; the Rev. Jackson steps out of the room to waiting media to announce that he would run. To everyone surprise Rev. Jackson became the candidate because he was bold enough to say, "I will run." At that time, only Marion Berry had the infrastructure to run a national campaign. Hence we came to know Ivanhoe Donaldson and Donna Brazile. Mr. Donaldson later ran into difficulties. But, Ms. Brazile has gone on to a successful career as a political consultant and media personality. At 19 years old, she was one of the key organizers of the 1983 March on Washington where Stevie Wonder released, "Happy Birthday" in honor of Rev. Dr. Martin Luther King, Jr. Those where some bold days that helped usher in this period of "Hope." Let's not blow this wonderful opportunity to put in place a national structure for running and supporting candidates of good will. When will the light bulb click on and people come to realize that honesty is the beat policy. Two many people in positions of responsibility are squandering their moral character over tawdry incidents of indiscretion. From Big City Mayors to Congress persons to government workers, the front news is filled with legal maneuvering among defense and prosecutors making charges and counter charges. The general public is left with a sense that the moral character of our countries leaders are weak. How does one stand for righteousness, if you are dodging accusations of wrong doing? What examples do youth have to follow when public officials have to walk around with the proverbial egg on their faces? Whether on a national, state or local level far too many persons are being haul into a court of justice to answer for actions done in the dark shadows of their lives. When will people learn that they have to live in the light of the day. When will people learn what my mother use to say, "what is done in the dark will come to the light." The Pastors, Churches and Institutions within the Upton Community of West Baltimore are planning a major Christmas Basket program. Church leaders will gather at Union Baptist Church, 1219 Druid Hill Avenue on Wednesday, December 17th from 12:00 noon to 1:00 p.m. to preach the Good News from the theme, "Reclaiming Our Community by Reaching the Heights of the Promise." 5 preachers will preach 5 sermons within forty five minutes. I'll release the line up in December. It will be explosive! Then on Friday, December 18th we will pack and prepare over 400 Christmas Baskets for residents of the 21201/21217 Zip codes. On Saturday, December 18th the Christmas Baskets will be given out. We plan to have a special celebrity participate in the distribution. Here is a hot question, should the President have bowed to the Japan's Emperor Akihito? Critics are suggesting it a sign of weakness. Others are saying its a sign of respect. For those who have traveled to the Far East would clearly understand that in their culture the younger bows to the older as a sign of respect. Within our culture we have lost the value of respect that's why men don't tip their hats to women, that's why youth don't help seniors across the street, and that's why people are killing each other. We have lost the value of respect. I applaud President Obama for understanding that we live in a world of human beings. If we can begin to respect each other that's when we will begin to listen to, to learn from, and to live with each other. The only job of those who oppose President Obama is to find fault in everything he does. The job of those who support this outstanding African American President is to affirm the truth of his actions. If leaders every learn to respect one another, than maybe people will learn it too! As the holiday season approaches, there will be many efforts to insure that families throughout America have food on the table. Holiday time is an increased season for mental and emotional stress. It is a time where persons find themselves feeling a sense of inadequacy. I feel we have a responsibility to bear each others burdens. Therefore, time some time to identify a program that will provide food to those in need in your community. We at Union Baptist Church are collecting funds now to provide Christmas Food Baskets to members of our community. With God's grace we should be able to serve over 300 families. Our partners are Maryland General Hospital, University of Maryland Baltimore, The Korean Businessmen Association, and a forthcoming celebrity announcement of support. Just a note of congratulations to my son, Alvin Hathaway, Jr., who passed the Maryland State Bar. He is now eligible to be admitted to legal practice in Maryland which is in the 4th Circuit of the U. S. Court of Appeals. President Obama just recently appointed Judge Andre Davis to that court as a Federal Judge in Richmond, Va.
My prayers go out to both of these distinguished African American Men who make us proud as our ambassadors for righteousness within the judicial system. Just a shout out to Brother Geoffrey Canada for the successful conference this past weekend highlighting the efforts and successes of the Harlem Children's Zone in New York. What is interesting to note is the commitment of many partners to eliminate the conditions that inhibit success for children and families and to not accept failure of any child in their academic or career pursuit. They have redefined the concept of wrap-around services to include every individual that the program touches receives the assistance they need to make it in our society. The challenge to communities such as Baltimore is to generate the political will to tackle a neighborhood with the holistic perspective of bringing overwhelming force to eliminate slum blight, low test scores, health disparities, and inequality in any form. Several communities are completing for this distinction. Some of the communities who are seeking to position itself as a "Promise Neighborhood" have had many attempts in the past to reverse the trends. I'm advocating and working for the Upton Community to become the "Promise Neighborhood" because of the tremendous assets contained within this historic West Baltimore Community: world class medical institutions, historic churches, state agencies, and its proximity to downtown Baltimore. Furthermore, all of the negative social indicators are present within this community. Yet, it has a network of schools to build upon and a community of interested and committed community leaders. We can be very proud of a President who doesn't forget where he came from. These pictures are of President Obama as "the man" and as "a child." Now the children and people of America will have health care coverage with the passage of the bill through the House of Representatives. Now, the Senate needs to approve its version of the bill and send it to Conference Committee to work out the details. Change is complex. Change has a cost. Change is what the average America needs. Congratulations President Obama and the members of the House of Representatives who voted to address the needs of others: 219 Democrats and 1 Republican. When will the Republicans ever learn that fighting against the needs of everyday Americans is a losing position? No amount of rationalization will take our country back to a era when the needs of people are on the back burner. We must never rest and never relent. Change is a aspect of freedom. Does anyone remember the soulful sounds of Grover Washington? When the weekend came his sound ushered in the merriment of a house party with your friends. I can remember chilling out in Philadelphia at his Annual Jazz event. The old days where good! The memories are great! When will the killings end? 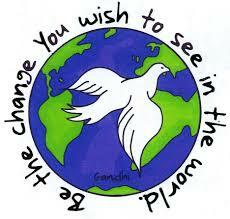 Instability of the mind and the pressures of our society are leading people to do inhumane things to other people. Senseless killing is a shock to our cultural norm. We are shocked by the public outbreaks of mass murders. We are immune to the daily killings that occur in American urban areas everyday. Is there a solution to humans killing other humans? I wish we could identify a remedy to this unfortunate phenomena. What if you went to sleep one night and then woke up the next morning and the President of the United States was Michael Steele? That is a daunting thought! Just offered this blog because sometimes you just need to laugh out loud. I will give Steele credit for being able to maneuver around and through obstacles to end up with a good job. He is getting paid. He is getting national exposure. He is the most visible African American within the Republican party. If that is all he wanted he has accomplished his goal. The scripture reminds us, "For what will it profit a man if he gains the whole world and forfeits his soul? Or what shall a man give in return for his soul?" Does anyone recognize this city? Hint: The twins towers was featured in the movie, "Entrapment" starring Sean Connery and Catherine Zeta-Jones. Second hint: It is not in America. As African American people we must regain our sense of travel and adventurous zeal. We are descendants of great migrators who traveled distant lands by sea, land, and now air. Our world is getting smaller. Our reach is getting wider. Be safe in your travels. The spirit of God is everywhere. Why do we have to make a choice between the two producers? Why does one have to be critical of the other? Why can't we just get along? We cannot have a short sighted view of obtaining wealth in America. Wealth is intergenerational. Real wealth is not obtained in one lifetime. We need African American people about empire building. Therefore, I applaud both of these men for entering into a world of movie making with nothing but their God given talent. They both have made an impact on the production of films. They have provided opportunities for talent to have a media of expression. They have created jobs. They have succeeded against all odds. Brother Spike should direct his tirades against a system of exploitation that pigeon holes all screenwriters into producing films, stories, and shows that require white distribution systems and funding to get to the marketplace. The beauty of the marketplace is there is room for all products. Therefore, references to times when African Americans had no clout in the movie making industry is not relevant to today when Tyler Perry, Bishop T.D. Jakes, Will and Jada Smith and Spike Lee are proving that they don't have to bend over to have their products produced and distributed. The African American Marketplace is saying by their spending dollars; there is room for them in our pocketbooks. Drop the criticism and build a distribution network that doesn't require White approval of the products your creative geniuses have in mind. I must commend Rev. 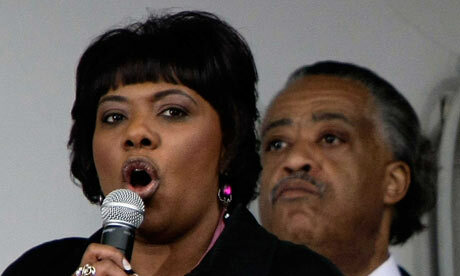 Bernice King for stepping up to the plate as the new President of SCLC. Her challenge will be to chart her own course and develop a relationship with the everyday people of America. Unfortunately, I believe she may very well be trapped in the role of a public image without public support. If she is willing to do the grass roots organizing throughout America that is necessary, she can be effective. But if she is reduced to preaching, speaking, and televised appearances, she will be ineffective in mobilizing the masses. If the role of charismatic leader is her choice, she will have a difficult time relating to the youth of America, particularly our African American youth who are disenchanted with the status quo. But, if she is willing to take the road less traveled, visiting the local communities of America and "taking it to the streets" she may have a marvelous chance to chart her own course and make her own way. I pray she choses the latter. This is a picture of the Turkish air force, similar to our Blue Angels. This formation mimics the flight pattern of birds as they migrate south for the winter. It's a formation where the lead breaks the wind force barrier thus permitting those behind to be able to fly with less resistance. When birds use this formation the lead flies until he is tired and then falls back and another takes the point position. By working together they are able to accomplish more than they would if they worked separately. When will we learn this lesson? It's amazing to me that organizations are sponsoring discussions on race. It's as if talking about it will solve the economic, health, and racial disparities within America. Many understand that 40 acres and a mule is a far distant dream. Many understand that reparations is an overdue remedy. Some understand that the tremendous wealth that many within the white community enjoy was derived from the no payment or underpayment of colored labor. Some understand that inventions for which patents should have been given were stolen from colored inventors. What you may not known is that slaves were taxed as property (chattel). As a result states received tax benefits for the insidious practice that forced many of our ancestors to labor and die to enrich others. States owe real money to those of us who understand that there enrichment was also upon our backs. States who derived taxes from the ownership of slaves have a outstanding debt to repay. If you want to talk about race - let's talk about that! On my way to a church meeting I'm praising God now for what he has done, is doing, and will do! I have to keep reminding myself and everyone else. This is really God's business. Does anyone like pumpkin pie? It's that time of the year when the pumpkin comes out and are harvested. I grew up liking the taste of sweet potato. Therefore, I never acquired a taste for the pumpkin. Come to think of it what do you do with a pumpkin other than make it into a pie? I'm open for suggestions. I know there has to be other uses than simply cutting faces on to sit on the porch for the squirrels to eat. When I lived deep in the city, it was the mice who enjoyed the pumpkins on the steps. Just thinking about how one protects their home. There was a time when we would say that "your home is your castle." Castles were protected by cannons and high walls. How do you protect your castle? In other words how do you protect your home? Locking doors, burglar alarm system, mean dog, or a trusted Smith & Wesson. Ultimate protection is found in the saving power of Jesus Christ. In subscribe to the Passover method of protection. I pray the blood of Jesus Christ over the door posts and the people of my home. That for me is the best protection! Today the reality of H1N1 hit home as our church took to his final rest a 21 yr old African American Male. The seriousness of this new disease has made its way into the home of one of the members of our community. The young man was good and God fearing. Nevertheless, he was stuck down so early in life. We must be very careful and learn about this and all communicable diseases. We need to take all reasonable precautions. We must learn to live healthy lifestyles. Breaking news! The Maryland State Governor's Committee on the National Register voted unanimously this morning to have the Union Baptist Church placed on the National Register of Historic Landmark places of the National Park Service. This designation insure that the contributions of Union Baptist Church to African American History in Maryland and the Nation will be forever told. The 157 year old African American Church fellowship built its main sanctuary at 1219 Druid Hill Avenue, Baltimore, Maryland 21217. The church structure was designed by internationally and nationally known architect, Mr. William J. Beardsley. In the midst of a "Preserving Our Sacred Space" Campaign, Rev. Dr. Alvin C. Hathaway, Sr, Senior Pastor, states, "this development enhancing our attempts to obtain federal and state funding for the total restoration of our facility. We envision a visitor's center where people can visit, learn and study the development of a faith community who has focused its ministry on serving people." I believe future generations will come to learn and respect the contributions of outstanding leaders who attended and led our church." This is an outstanding day in the work of the Lord"
Does anyone wake up in the morning and say, "I would like to have some sushi?" Its amazing how Asian culture has impacted African American eating. So many people I know eat sushi on the side. Sneaking out to Asian restaurants and eating raw food. It looks pretty, but with no labels; how do you know what the nutritional values may be? Eat it if you must. Enjoy it if you like. My questions still remains, "who eats sushi?" See I don't eat sushi! I eat the California roll (smile)! Have we forgotten the awesome struggle people of color waged to end segregation in public schools? If the quest for a quality education is so fused into our DNA; why have we settled for poor schools in either the neighborhoods in which we live or the neighborhoods where we are from. When was the last time you visited a neighborhood school? Are you aware of the conditions students are forced to learn under? I visited a school around the corner from the church where I serve. I was shocked to find out that practically every student in that school was at least a grade level behind in math and reading. Without serious intervention those student will not have a chance in the real world. It would be tragic to sentence a school population to living lives or unfulfilled dreams because their educational preparation was deficient? If our ancestors had to courage to end segregation, then let us muster the courage to end low quality schools! Just a shout out to my cousin who lives and plays in South Beach Florida - Will Bridges. He is the consummate professional who is known as one of the best musicians in Florida. If you have been to South Beach and heard any live entertainment it most likely was from either him or members of his organization. He carries on the tradition of musicians within my family who understands "real" music. For some people today is a holiday. I believe a person should read a new book on a different subject at least twice a month. 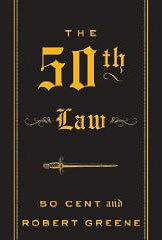 Currently I'm reading, among others, "The 50th Law." It's well written and easily readable. I recommend it to those of you who treasure reading as a spiritual discipline.